Samba is an opensource and most popular package that provides file and print service using SMB/CIFS protocol. This step by step article explains how to setup file server on centos 7 using samba . Before starting please make sure you have assigned static IP for the server and have internet connectivity for installing packages. Step 1 » Install necessary samba package and dependencies using below command . [root@krizna ~]# yum install -y samba samba-client samba-commonand enable the smb and nmb service . Step 2 » Choose or Create a directory for shares and allow in SELINUX . [root@krizna ~]# chcon -R -t samba_share_t /sharesand check the selinux policy status using ls -Z. Step 3 » Allow samba service in the firewall and reload service. Step 4 » Make a copy of default conf file for backup. Step 5 » Edit /etc/samba/smb.conf file, Find “security = user” line and add “map to guest” line like below. 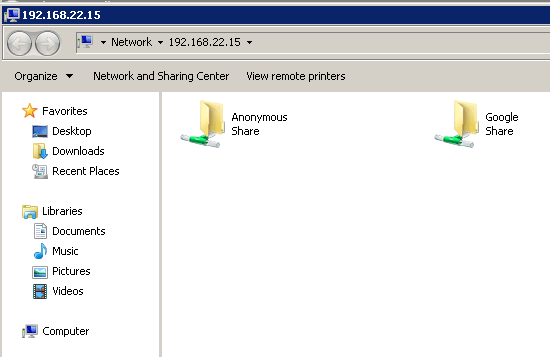 Step 6 » Home directories and printer shares are enabled by default. You can stop those shares by commenting [homes] and [printers] sections in /etc/samba/smb.conf file like below ( optional ). Anonymous share allow everyone to access the share without username & password. 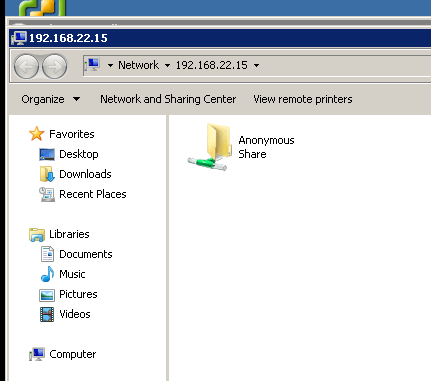 Step 1 » Create a directory for anonymous share and change the ownership to nobody to allow anonymous access. Step 2 » Edit /etc/samba/smb.conf file and add these lines at the end of the file . Step 3 » Restart smb service . Step 4 » Now try to access this share in windows machine using \\IPaddress in Run prompt[ Eg: \\192.168.25.15 ]. You will see the share directory like below. Secured shares are accessible only by valid users with username and password . Here i have explained with below scenario. Larry has access to share google and Mark has access to share facebook . We can have a samba group if we want to give access for multiple users.So here we have to create samba group for each share and assign users in that group for access. Step 1 » Create directory and group for the share name google. Step 2 » Change ownership and permission for the directory. Step 3 » Create user larry by adding to the group smbgg in a single command . [root@krizna ~]# useradd larry -s /usr/sbin/nologin -G smbggCreate samba password using the below command . Step 4 » Now edit /etc/samba/smb.conf file and add the below lines at the end for Share “google”. Now after restarting the smb service, You can access Google share using larry credentials. Step 5 » You can create “facebook” share and user Mark in the same way. But make sure you create different group like “smbfb” for Facebook share and add user mark to that group. Step 6 » For multiple share access create user by adding both the groups to access both shares. You can share users home directory by just enabling home section in smb.conf. Step 1 » You can add or enable home section in /etc/samba/smb.conf file that should looks like below . Step 2 » Selinux may prevent write access to home directories. Enable access using below command. Step 3 » Now restart service. Now you could access users home directories. Perfect article . Thanks ! !